The device fits into the vehicle and captures the GPS location information apart from other vehicle information at regular intervals to a central server. Other vehicle information can include fuel amount, engine temperature, altitude, reverse geocoding, door open/close, tire pressure, cut off fuel, turn off ignition, turn on headlight, turn on taillight, battery status, GSM area code/cell code decoded, number of GPS satellites in view, glass open/close, fuel amount, emergency button status, cumulative idling, computed odometer, engine RPM, throttle position, GPRS status and a lot more. 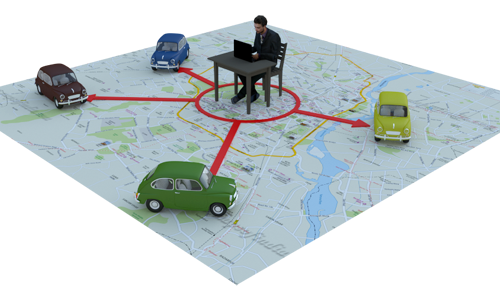 Capability of these devices actually decide the final capability of the whole tracking system; most vehicle tracking systems, in addition to providing the vehicle's location data, feature a wide range of communication ports that can be used to integrate other on board systems, allowing to check their status and control or automate their operation.